Azzi, Stephen. 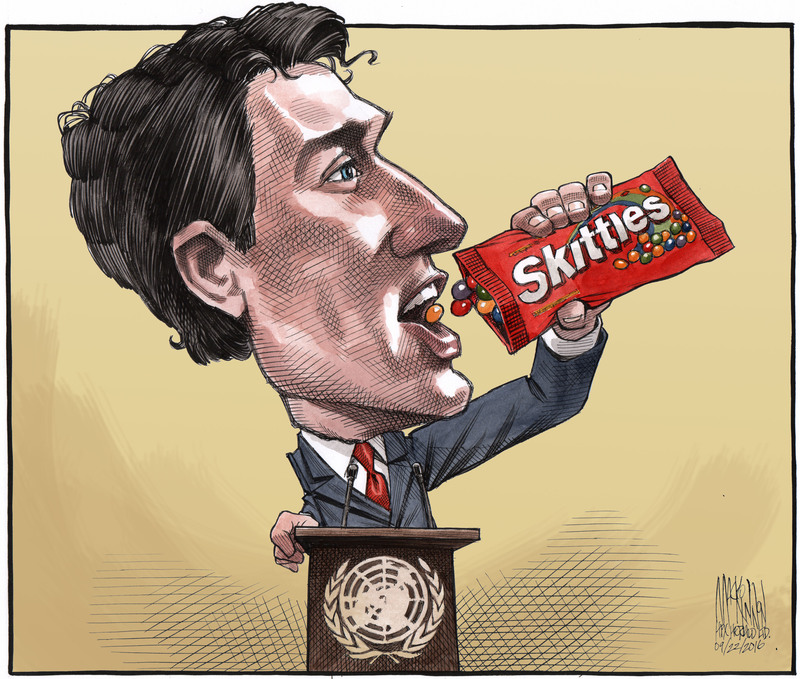 "Justin Trudeau ". The Canadian Encyclopedia, 04 April 2018, Historica Canada. https://www.thecanadianencyclopedia.ca/en/article/justin-trudeau. Accessed 23 April 2019. Justin Pierre James Trudeau, PC, 23rd prime minister of Canada 2015–present, teacher, public issues advocate (born 25 December 1971 in Ottawa, ON). 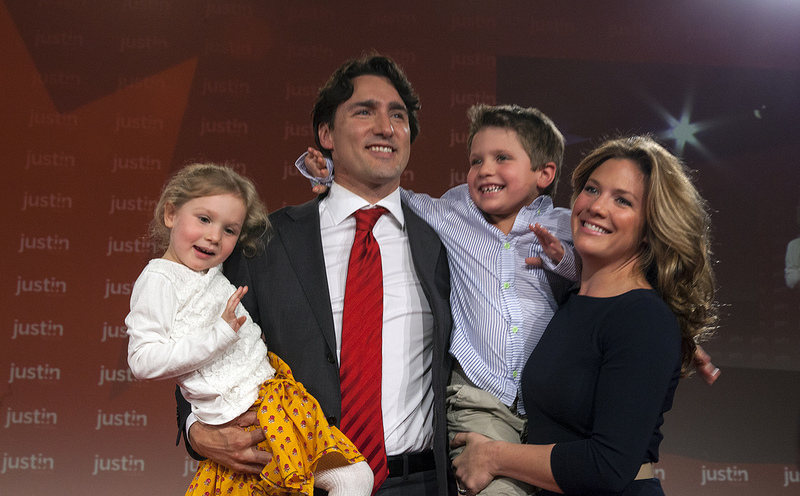 The son of Pierre Trudeau, the former prime minister, Justin has repeatedly defied expectations. In 2007, he won the Liberal nomination in the Montréal riding of Papineau, beating the establishment’s candidate. A year later, he was elected to the House of Commons, confounding pundits who insisted the Trudeau name was political poison among francophone voters. After winning the Liberal Party leadership in 2013, Trudeau propelled the party from third place to first in the House, becoming prime minister at the head of a majority government. 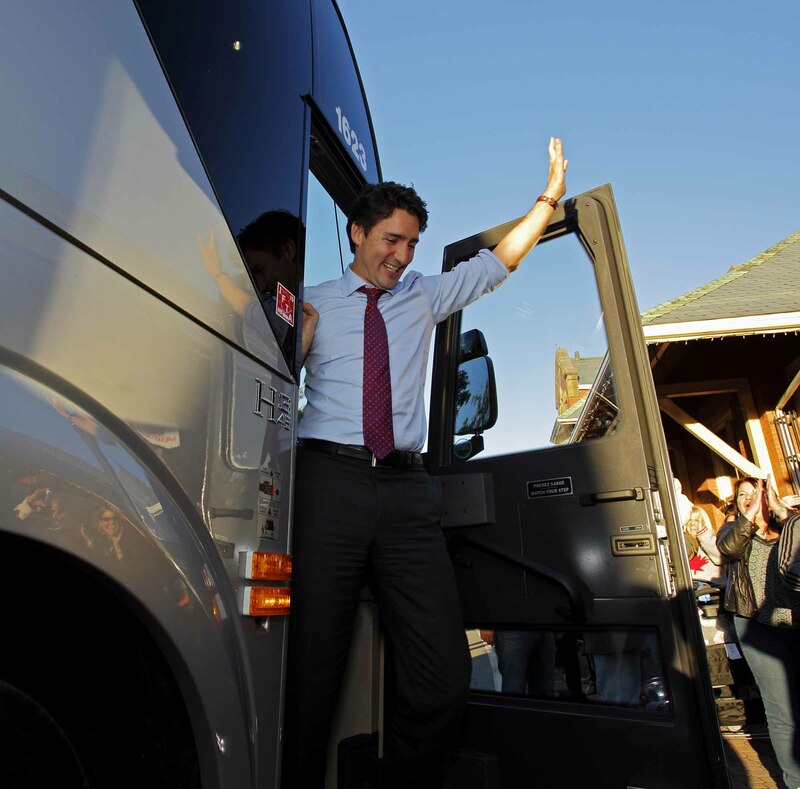 Federal Liberal Party leader Justin Trudeau visits Sussex, New Brunswick, in October, during the 2015 Canadian federal election campaign. Justin Trudeau, the eldest son of Pierre and Margaret Trudeau, was born in Ottawa on Christmas Day, 1971. He had politics in his blood: his father was prime minster and his maternal grandfather, Jimmy Sinclair, was a federal Cabinet minister in the 1950s. After his parents separated when he was six, Justin and his two younger brothers Alexandre and Michel lived with their father. In their early years, the boys lived in the prime minister’s official residence, 24 Sussex Drive, where they were often in the public eye. Trudeau triumphant after the 1980 election, determined to bring the constitution home to Canada (courtesy Canapress). When Justin was 12, his father retired from politics and moved with his sons to Montréal, where Justin completed his secondary schooling at Collège Jean-de-Brébeuf, his father’s alma mater. Trudeau attended McGill University, where he was a member of the debating team and a volunteer in the student society’s Sexual Assault Centre. After graduating with a Bachelor of Arts in English literature in 1994, he spent a year travelling overseas. He returned to McGill, where he studied to become a teacher. Before completing his degree, Trudeau moved to Whistler, British Columbia, where he became a snowboarding instructor and worked as a bouncer at a nightclub. After several months, he returned to teacher’s college, this time to the University of British Columbia, where he earned a Bachelor of Education degree in 1998. After working as a substitute teacher in Coquitlam, BC, he found a permanent position at West Point Grey Academy, a private school in Vancouver, where he primarily taught French and math. Eventually he moved to the public school system, teaching at Sir Winston Churchill Secondary School in Vancouver. Two tragedies helped alter the trajectory of Trudeau’s life. He was deeply shaken when his brother Michel died in an avalanche above Kokanee Lake, BC, in 1998. Then in 2000, Trudeau’s father died of prostate cancer. Trudeau’s eulogy at the televised state funeral brought him back to the public eye, and fuelled speculation that he would pursue a career in politics. Between 2002-2007 Trudeau returned to Montréal to study first engineering at the University of Montreal’s École Polytechnique, and then environmental geography at McGill. He did not complete either program, turning instead to advocacy work. Trudeau and Sophie Gregoire started dating in 2003. She had been a childhood friend of his younger brother Michel and was working as a television and radio host for both French and English networks in Québec. They married on 28 May 2005 and have three children — Xavier, Ella-Grace and Hadrien. Trudeau first became active on several public issues, beginning in Vancouver. After his brother’s death, he worked to increase avalanche awareness, becoming a director of the Canadian Avalanche Foundation and helping to establish the Canadian Avalanche Centre. He also served as a director of the Katimavik youth volunteer service program, eventually becoming chair of the board. He spoke out on environmental issues, heading the Nahanni Forever campaign, aimed at protecting and expanding the Nahanni National Park Reserve in the Northwest Territories, which was threatened by a proposed mine. In 2006, Trudeau was master of ceremonies at a large rally in Toronto, urging the United Nations to do more to end ethnic cleansing in Darfur, Africa. In 2008, he urged young people to participate in politics in a speech at the National Me to We Day rally in Toronto, an event organized by the Free the Children charity. 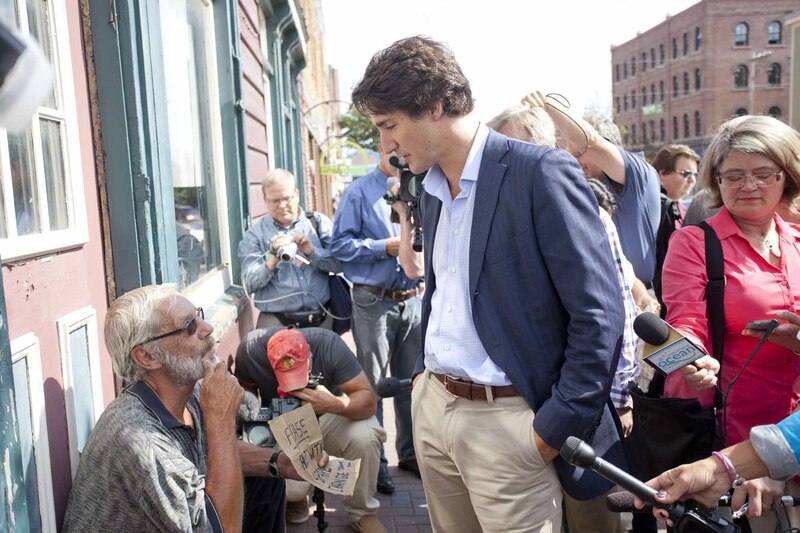 Throughout this period, Trudeau was a frequent media presence. He was master of ceremonies for the Giller literary prize gala; he portrayed First World War soldier Talbot Papineau in a CBC miniseries; and he hosted a weekly current events segment on a Montréal French-language radio station. 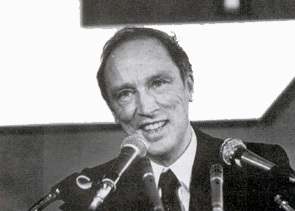 Trudeau had not been active in party politics in his youth, but after the Liberal defeat in the federal election of 2006, he offered his help to Tom Axworthy, former principal secretary to Pierre Trudeau and head of the party’s Renewal Commission. Axworthy appointed Justin chair of the commission’s task force on youth issues. 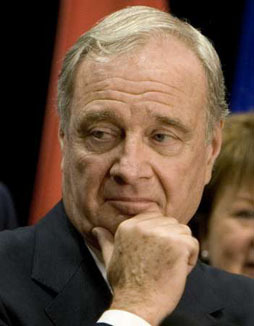 In the 2006 Liberal leadership race, Trudeau campaigned for former Ontario Cabinet minister Gerard Kennedy, transferring his support to eventual winner Stéphane Dion after Kennedy dropped out. 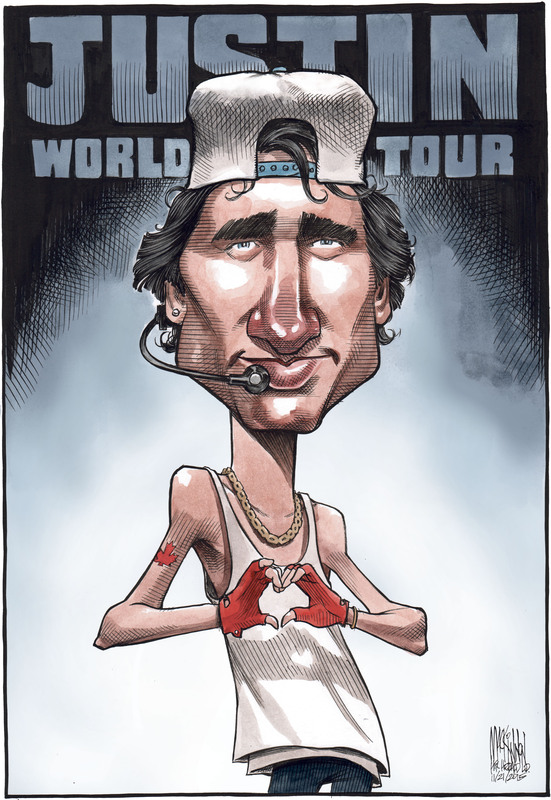 In the process, Trudeau discovered that he had a talent for campaigning. In 2007, this helped him win the Liberal Party nomination in the Montréal riding of Papineau, where he defeated the party establishment’s favoured candidate. Francophones made up almost half the population of Papineau. Many were Québec nationalists who had helped elect a separatist Bloc Québécois member of Parliament (MP) in the 2006 election, and who claimed that Trudeau was hostile to Québec — as they believed his father had been. On election day in 2008, Trudeau won the riding, but his party lost the general election, with the Conservatives remaining in power with a minority government. After Michael Ignatieff became Liberal leader in 2009, Trudeau was named the party’s critic for youth and multiculturalism, and later for youth, citizenship, and immigration. Although Trudeau was re-elected in Papineau in 2011, the federal election was a disaster for his party, which fell to third place in the House of Commons. The Conservatives won a majority of the seats, while the second-place New Democrats supplanted the Liberals as official Opposition. The result was the worst in Liberal Party history, leading some analysts to predict the party’s impending death. After Ignatieff stepped down, pressure mounted on Trudeau to seek the leadership, but many critics refused to take him seriously, questioning his experience and intellectual abilities. Friends advised Trudeau against taking on the younger and heavier Brazeau, a former soldier who held a black belt in karate. Pundits assumed Trudeau would lose: the only question was whether he would be hurt in the ring. But they had not factored in Trudeau’s experience as an amateur boxer and the training regimen he followed before the fight. Trudeau calculated that Brazeau, a smoker, would not last long in the ring. In March 2012, Trudeau won the bout in the third round after the referee stopped the fight. 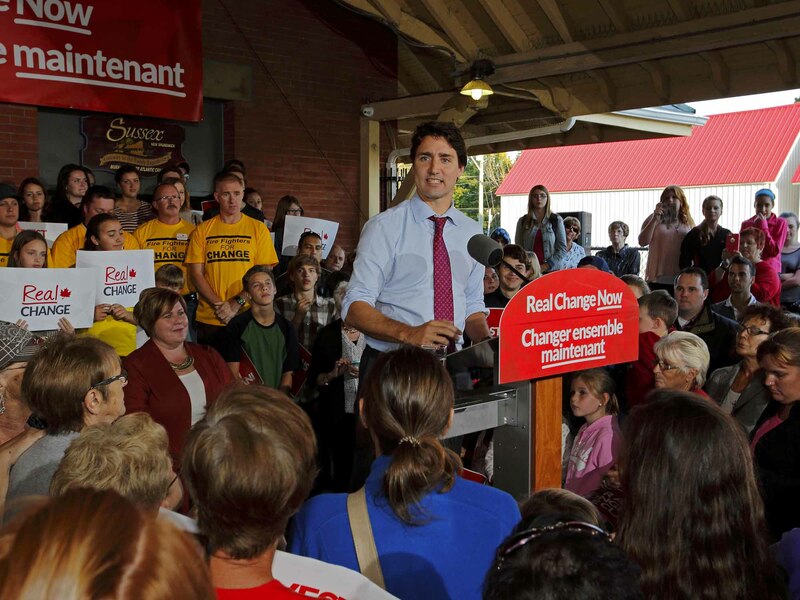 On 2 October 2012, Trudeau launched a campaign for his party’s leadership. He quickly emerged as the frontrunner over his lesser-known rivals. 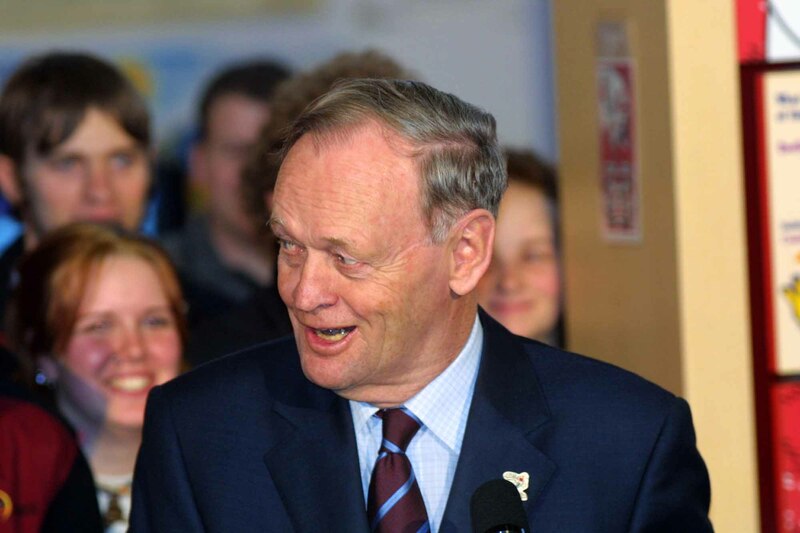 His candidacy stirred widespread public interest, and the popularity of the party began rising in opinion polls in anticipation of a Trudeau victory. On 14 April 2013, he easily secured the leadership, winning almost 80 per cent of the vote. 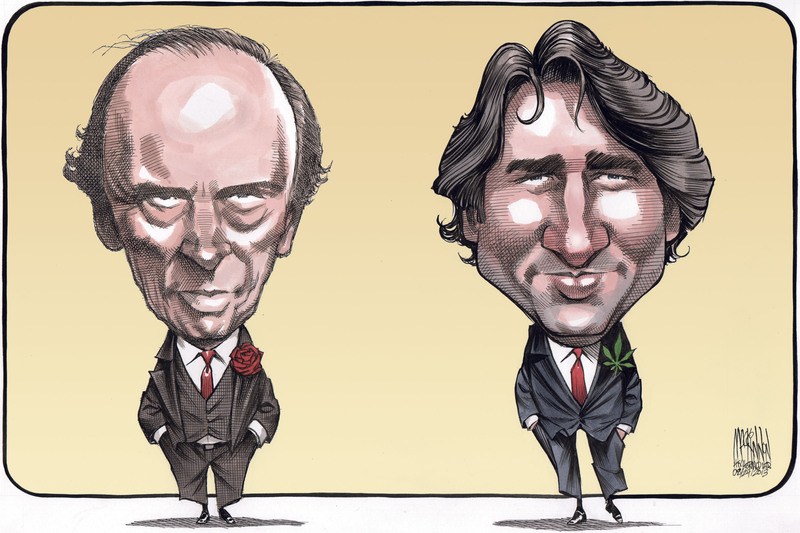 Trudeau immediately set out to reinvigorate a struggling Liberal party, torn by the civil war between former prime ministers Jean Chrétien and Paul Martin, and reeling from Ignatieff’s ineffective leadership. Trudeau proved to be an energetic cheerleader and a formidable fundraiser. Meanwhile, opponents viewed him as a dilettante. The Conservatives under Prime Minister Stephen Harper calculated that Trudeau would eventually trip in an election campaign, if given enough time. Harper called the election more than two months before voting day, launching the longest federal campaign since the 1870s. In recent campaigns there had usually been two televised leaders’ debates, one in English and one in French. This time, the New Democrats and the Conservatives pushed for more debates, convinced that Trudeau would fold under the pressure of the spotlight. The three parties agreed to an unprecedented five leaders’ debates. Exceeding expectations, the Liberals ran a solid campaign and Trudeau performed well in the debates. The Liberals promised a change from nine years of Conservative government, pledging to legalize marijuana, admit tens of thousands of Syrian refugees, and run small deficits to fund infrastructure improvements. On election day, 19 October 2015, the Liberals jumped from third to first place, winning a majority government of 184 out of 338 Commons seats — 150 more than in 2011. Trudeau immediately made headlines by forming a Cabinet composed of an equal number of women and men, a first in Canada. In its first two years, Trudeau’s government admitted 40,000 Syrian refugees to the country. It introduced plans for a national carbon tax by 2018, despite opposition in some provinces. It cut the personal income tax rate on middle-income earners while increasing it on wealthier Canadians — although higher Canada Pension Plan contribution rates were expected to reduce the overall tax savings for many. 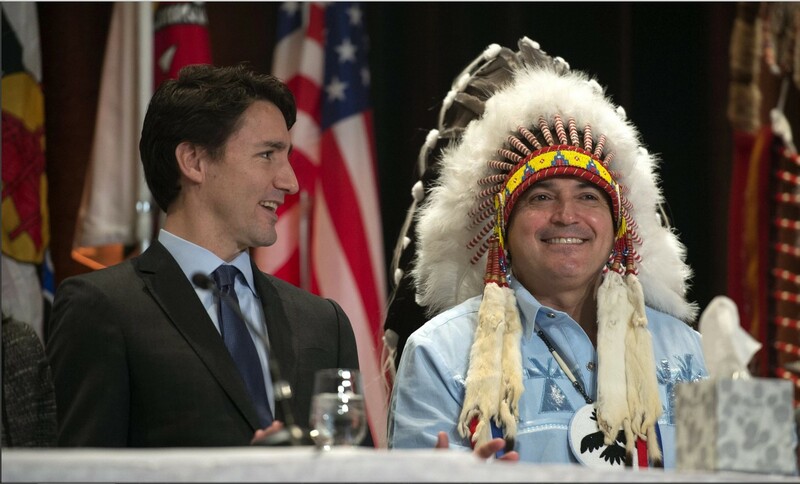 The government appointed the National Inquiry into Missing and Murdered Indigenous Woman and Girls, although this became mired in internal conflict and disorganization. The Trudeau government also legalized assisted dying in certain circumstances, legalized marijuana, announced a National Housing Strategy, and created the Canada Child Benefit for low-and middle-income families. Trudeau also apologized for three historic wrongs: Ottawa’s 1914 decision to deny East Asian passengers on the ship Komagata Maru entry to Canada, the abuse of residential school students in Newfoundland, and the federal government’s discrimination against civil servants based on their sexual orientation. 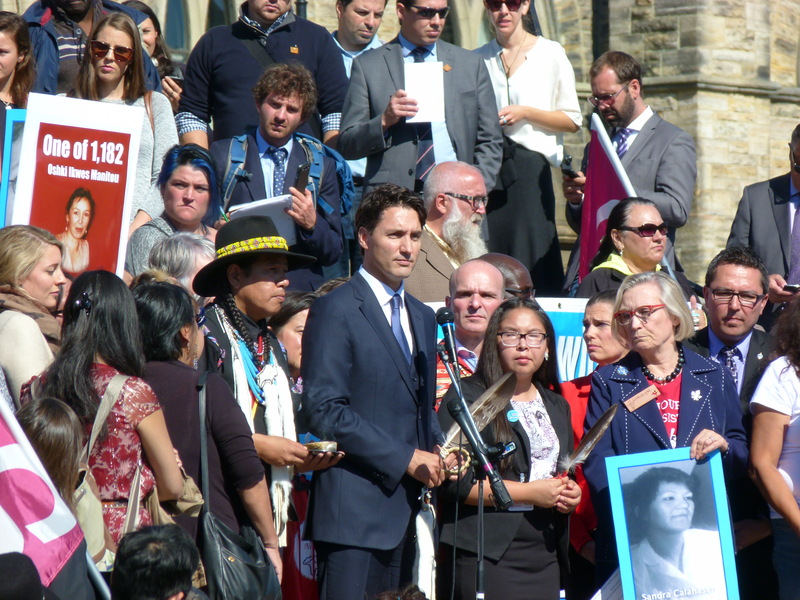 Justin Trudeau gives a speech on missing and murdered indigenous women in front of parliament in Ottawa (October 2016). Trudeau carried out the first significant reform of the Senate since the 1965 imposition of a retirement age of 75. In opposition, he promised to work toward a non-partisan Senate and, as a first step in 2014, pushed Liberal senators out of the party’s parliamentary caucus. 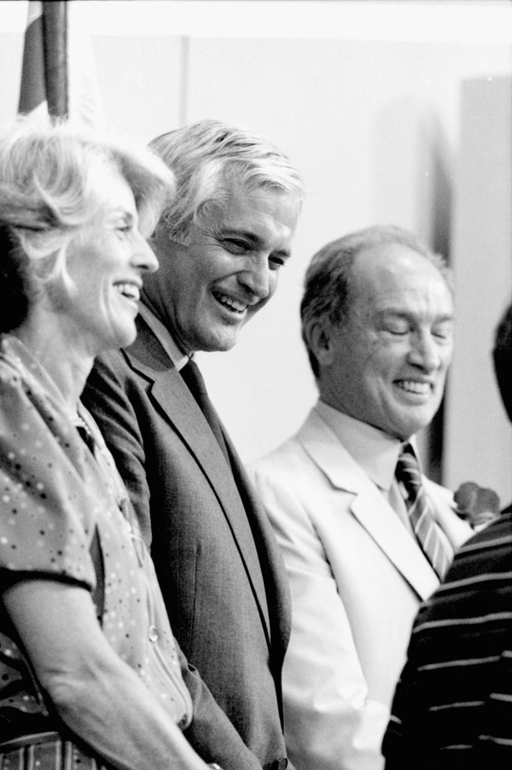 As prime minister, he appointed an advisory board to recommend Senate appointees based on merit, and he established a government leader in the Senate independent of any Senate caucus. Meanwhile, new senators would sit as independents, not as members of a party caucus. Within two years, the independents outnumbered Conservative senators, who had formed the largest caucus in the chamber. After the election of United States President Donald Trump in 2016, much of the Trudeau government’s attention shifted to Canada–US relations. The challenge came both from Trump’s threat to cancel the North American Free Trade Agreement (NAFTA) and his general unpredictability. 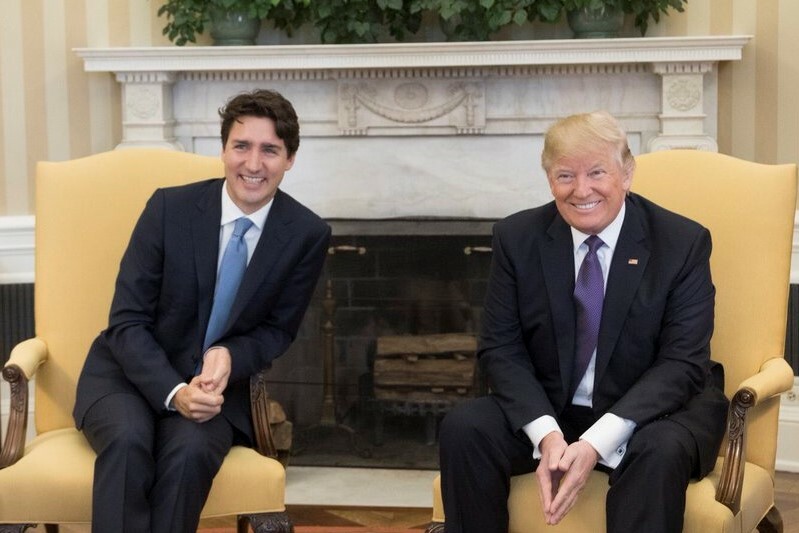 Trudeau formed a friendly relationship with Trump, avoiding public criticism of his policies. Trudeau also reached beyond the Liberal Party for help, consulting former prime minister Brian Mulroney, former interim Conservative leader Rona Ambrose, and seeking help from other distinguished Canadians with strong ties in the US. In early 2018, when it looked like the US threat to cancel the deal was more than a negotiating ploy, the Trudeau government took a harder line, challenging US trading practices in a complaint to the World Trade Organization. In 2017 Trudeau was embroiled in an ethics scandal — and found to have breached the federal conflict of interest law — after taking family holidays on the private Bahamas island of the billionaire spiritual leader Aga Khan, whose Canadian foundation is also a lobbyist of the Prime Minister’s Office and a recipient of federal funding. Trudeau has also faced criticism for backing away from a major 2015 campaign pledge to reform the electoral system. Meanwhile, his government has run larger-than-anticipated deficits and will have trouble balancing the federal budget before the 2019 election. It has also been unable to fix the new federal employee payroll system, called Phoenix, which has been mired in problems since its 2016 launch. As with previous governments, efforts to purchase new fighter jets and naval vessels have been repeatedly delayed. And Trudeau has faced opposition from environmental activists and the BC government over the Liberals’ decision to approve two new pipelines that would expand petroleum exports from the Alberta oil sands — an ongoing source of political tension in the second half of his mandate. 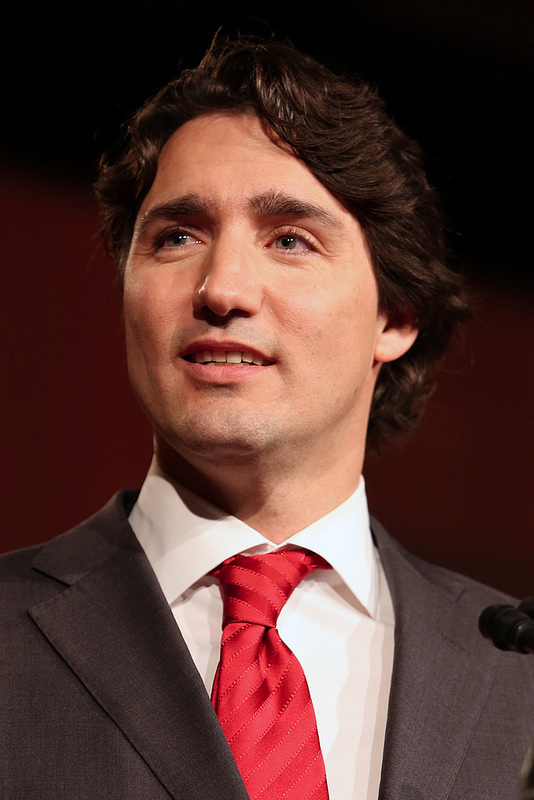 Member of Parliament ProfileOfficial parliamentary profile of Liberal Party leader Justin Trudeau. Liberal Party of CanadaThe website for the Liberal Party of Canada.